I’ve recently started using Pekwm again. Pekwm is a light window manager, in looks similar to Openbox or Fluxbox that allows you to tab windows, has good keychains options, can use dynamic menus (‘pipe-menus’ in Openbox) and supports pixmap themes. I played with it a little nearly a year ago, but never long enough to explore all its possibilities. I’ve now grown very fond of it, and have worked out solutions to all the little things that bothered me at first. The documentation is excellent and covers all what you need to configure Pekwm (the documentation is for Pekwm 0.1.5, though, and doesn’t cover some of the new features introduced in the latest stable version, 0.1.6). Below are some of my own settings to make Pekwm behave the way I want it to. This is meant mainly to remind me what I did if I need to reinstall Pekwm later on, but perhaps some of you will find some use for it as well. #Remove the following line if you want to use click to focus. And: #Uncomment the following line if windows should raise when clicked. The default configuration in Pekwm (and Fluxbox, actually) for the display of menus, specifically the hiding or closing of menus, irritates me. To close an open menu, you either have to launch one of the items on the menu or right click on the menu heading. I am, however, used to Openbox’ approach: when you click anywhere outside the menu or when a new menu is launched, the open menu simply disappears. Here is how to achieve this in Pekwm. The harbour is Pekwm’s version of Openbox’ dock or Fluxbox’ slit. It is the place where dockapps are loaded. Unlike the dock and the slit, the harbour cannot be set to autohide. Since I don’t like panels, I use the harbour for a system tray (docker) and a clock (bbtime or lal), but I don’t want to have it always on top or always below all other windows; nor do I want a strut for it. Here is what I did to create a ‘semi-autohiding’ harbour. My harbour shows up in the lower right corner of my screen. This toggles the harbour whenever I move my mouse to the bottom of the screen. The downside is that there is no ‘autohide’ feature; to make the dock disappear again you have to move your mouse back to the bottom of the screen. To set the harbour to disappear again, I’ve configured Pekwm to hide the harbour again when I click on a window or window title. I added the option “Set HarbourHidden” to the following lines. This isn’t quite autohiding, but it is good enough for me. As I don’t use a panel, the way the alt-tab window switching works is a big deal for me. I’ve never grown very fond of Fluxbox, for example, because it doesn’t have an alt-tab display. The default alt-tab behaviour in Pekwm does not focus the next window and place it at the top of the list. The default alt-tab therefore switches between windows in the order that they were launched. Impractical in my book, but this is easy to change. In the keys file, change “NextFrame” and “PreviousFrame” into “NextFrameMRU” and “PreviousFrameMRU” (there is already a default entry with these commands). Reload Pekwm and you will have a ‘normal’ alt-tab. Pekwm is a great window manager. The only downside is its scarcity of good themes. You can find a few on Box-look, Hewphoria, and FreshMeat, but most of these are visibly several years old (some aesthetics change rapidly). So if you use Pekwm and have some artistic ability, please create some new themes! You can use several applications to adjust the volume. Try alsamixer, a command-line mixer for alsa which comes with ubuntu (part of alsa-utils), or one of the many frontends for it: alsamixergui; qamix, a Qt front-end for alsamixer; gamix, a Gtk front-end; or (if you can tolerate gnome dependencies) gnome-alsamixer. You can also use xfce4-mixer, though it loads xfce-mcs-manager which might interfere with your gtk settings if you use another method to apply these. You can use all of these to control the volume, 3D switches, the volume of CD audio, line-in, headphones, phone, etc. There are also several dockapps available to adjust the volume. Have a look here. Several panels also have plugins to adjust the volume: this is the case for the lxpanel, perlpanel, xfce4-panel (using xfce4-mixer), gnome-panel, and kicker. While all these applications may be useful, it is generally easier to change the volume by pressing a single key or a combination of keys on your keyboard. How can you accomplish this in Openbox? To make these commands more convenient, assign keyboard bindings to them in the rc.xml file. I use Ctrl+Up, Ctrl+Down, and Ctrl+Alt+End to turn the volume up, down and on/off. If you are more of a mouse person, you could also use a dockapp with launchers and assing the above commands to some launchers. If you like an on-screen display when you change the volume, you can use OSDsh, a small application that shows the volume levels of your soundcard whenever they change. It is in the Ubuntu repositories. 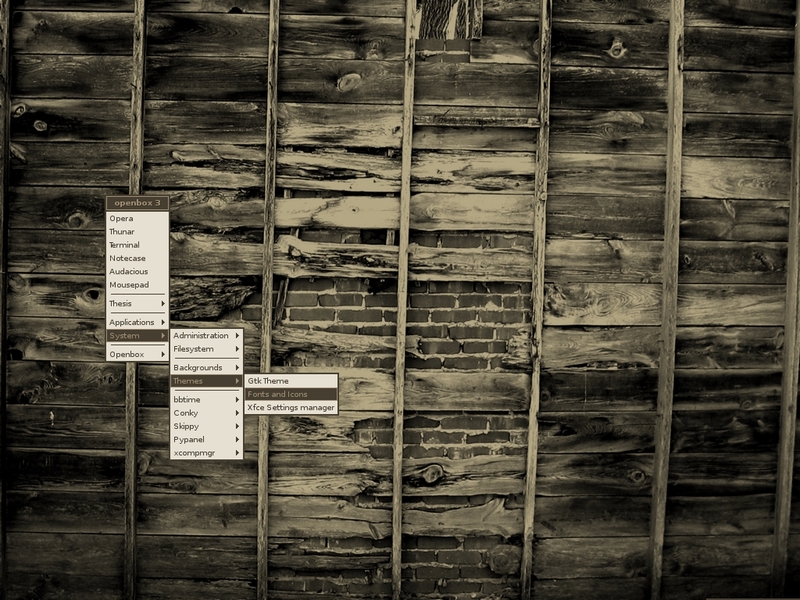 There are several ways to set the wallpaper when you use a window manager, like Openbox, without a desktop environment. Some window managers, like Fluxbox and Icewm, can set a desktop background (with fbsetbg and icewmbg respectively); Openbox doesn’t deal with the desktop, so you’ll have to use a separate application to accomplish this. The following might still be useful for Fluxbox and Icewm users, as some of the applications discussed below do more than simply display an image on the desktop. The most popular ways to set a desktop wallpaper in Openbox is by using either Feh or Nitrogen (see my Openbox guide), but there are many other possibilities. I will discuss a few here. If you know of any others, please let me know. Below I only mention the options and configurations I found useful and/or interesting. Most of the applications have a lot more options than those listed below. As always, I recommend reading the man pages (type “man name of the application” in a terminal) for each app to see what it all can do. All of the applications discussed here are in the Ubuntu repositories (from Dapper onwards).Many of them are quite old, but they still do the job. I generally use Feh (both as an image viewer and to set the wallpaper), though I am also fond of Habak and Hsetroot. Use whatever you like best. Xli is an “X image loading utility”. Like Feh, Xli is basically an image viewer, that can optionally display an image on the desktop. When viewing an image with xli, you can rotate the image clockwise (press ‘r’) or counter-clockwise (press ‘l’) or change the brightness (press 0-9). Other options are -fillscreen (to fill the entire screen; the image will be zoomed if smaller than the screen) and -fit (makes the image fit to the screen; if the image is smaller it is tiled to fit the screen). If the image is smaller than the screen, xli will draw a border around the image; you can set the colour of the border with -border COLOUR. You can draw the image in greyscale (using -gray), brighten it (using -brighten percentage), or zoom in (using -zoom percentage). 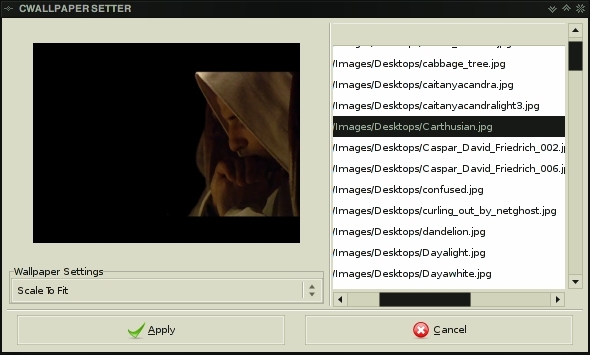 Xloadimage is also an image viewer for X. Xloadimage and its component xsetbg accomplish the same tasks as xli, and the very same commands that xli uses are used in xloadimage (just replace xli with xloadimage in the commands given above). Hsetroot does a lot more than just displaying an image or a colour on the desktop. 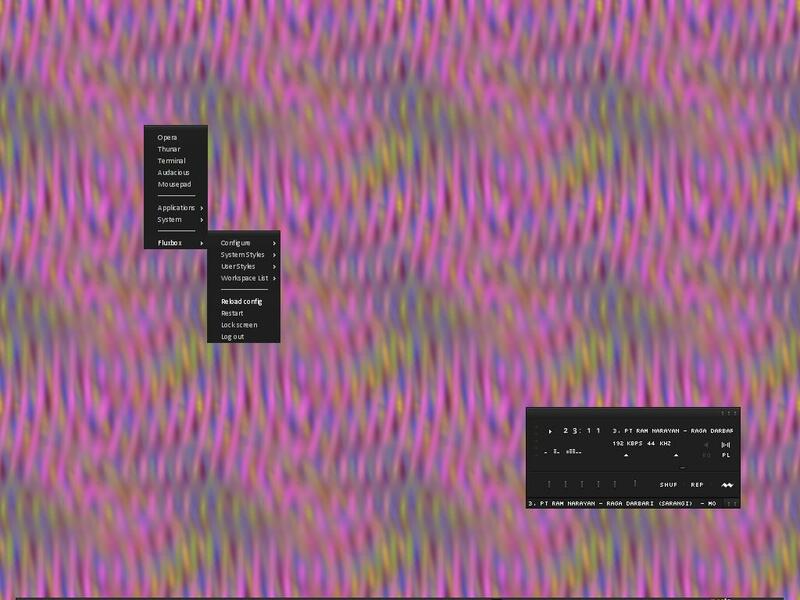 As the website tells you, hsetroot “is a tool which allows you to compose wallpapers.” Not only can it set solid colours, gradients or image files (centred, tiles, at full size or scaled), but it allows you to manipulate the images you want it to display as well. Thus you can tint an image, blur or sharpen it, adjust the brightness, contrast or gamma-level, flip the image (horizontally, vertically, or diagonally). 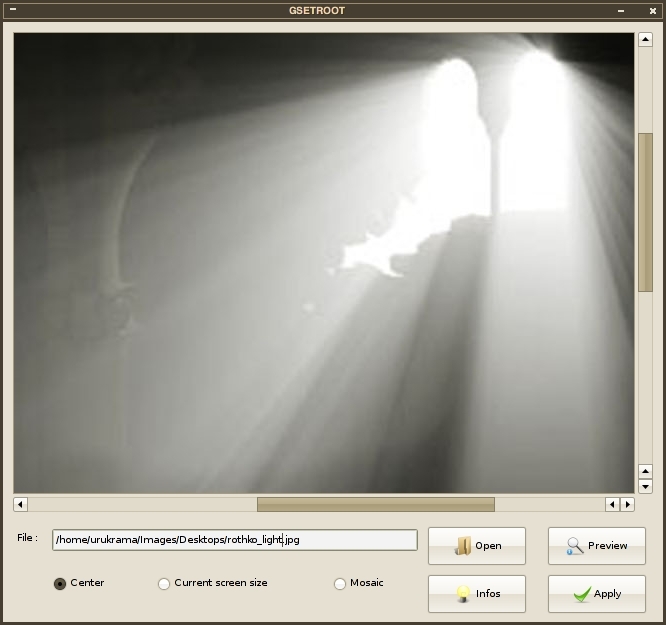 Hsetroot does all this without altering the image file it uses, though you can ask it to save a copy of the image it creates. 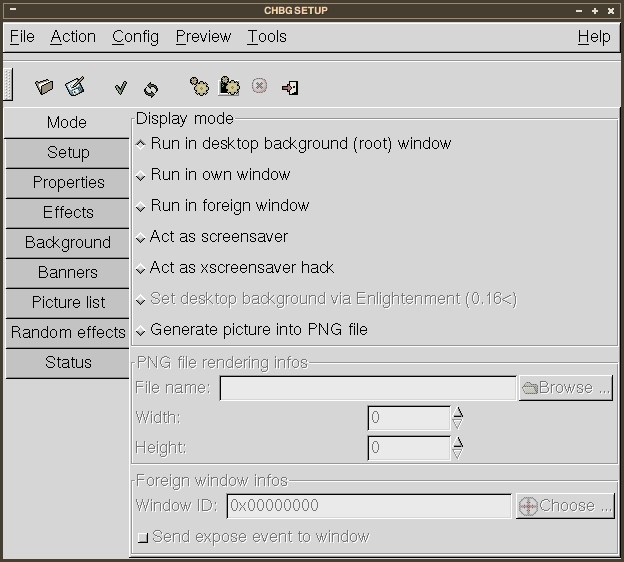 Habak is a versatile tool to set the desktop wallpaper and is part of the T2 Linux distribution (or, according to the developers, the T2 “System Development Environment”). It is a very useful application if you like to stack images on the desktop (with or without transparency), though it does a few more things than that. Like most applications discussed here, you can set a single image on the desktop (with “habak -hi /path/to/image/file), but you can also set a random wallpaper whenever the program is run. To do so, you have to direct habak to a directory of images (rather than a single image), for example: habak -hi ~/Images/Desktops/. Smaller images are automatically centred, images larger than your screen are automatically scaled. Neat. You can set more than images with Habak. You can set a single line of text using the command habak -ht “put your text here”. The text can be a command, such as the date (`date +%Y-%m-%d`). 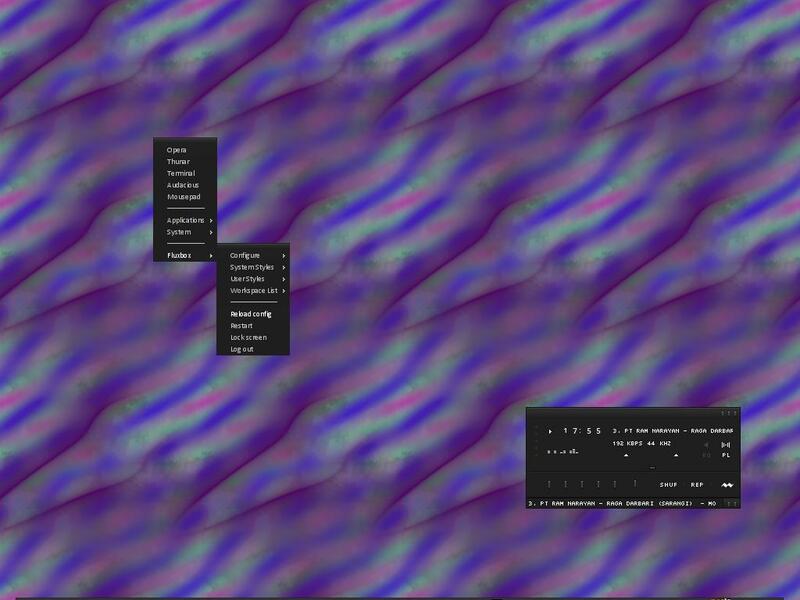 You can also fade out every other line of your desktop image (some sort of interlace) with the following commands: habak -hI int or habak -hI INT. The first fades out every even line, the second every uneven line; use both of them (habak -hI int -hI INT) to fade out the entire image. -mC: this centres the habak, and is used by default. -mp X,Y: this places the habak at the coordinates given for X and Y. -mS: this scales the habak, but respects the original proportions. -ms: this scales the habak, but disregards the original proportions. -mc: this modifies the colour of the habak. The colour string that should follow it is of the structure R,G,B,A — red, green, blue, and alpha (use something like gcolor2 to find out what the values are for your favourite colour). Thus -mc 0,0,0,255 gives black with no transparency. If unspecified, Habak uses the default semi-transparent light grey. -mf: this specifies the .ttf font to be used (you have to specify the entire path to the font file; make sure you specify the name of the font file, rather than the font name). If unspecified, a random font from ~/.fonts is used. -mh: this sets the font size (in pixels). The default is 30 pixels. Place the modifier(s) before the habak you want to modify. The options are applied in the order that the options are listed in the command: if an image comes after a text string, it will cover the text. Cwallpaper is a front-end for applications that set wallpapers. The website boldly declares that “it has the ability to work with any root wallpaper changer”. I have used it succesfully with feh, fbsetbg, Esetroot, hsetroot, xli, and xsetbg. As a front-end for other wallpaper setters, Cwallpaper is useful for those users who like to use command line applications but also like at times a graphical user interface. If you generally use Feh for setting the wallpaper, for example, whatever wallpaper you set with CWallpaper will also be reloaded when you restart Openbox (with “eval `cat $HOME/.fehbg` &” in your autostart file, off course). Before you first run CWallpaper, you will have to configure it. You will find an example configuration file in /usr/share/cwallpaper (or /usr/local/share/cwallpaper). Copy that file to ~/.config/cwallpaper/ (create it if it doesn’t exist), and edit it to your liking. Specify whatever program you want to use (default is fbsetbg) and the commands it uses to scale, tile, and center the wallpaper (“–bg-scale”, “–bg-tile” and “–bg-center” for Feh, etc.). Next, you will need to specify all the wallpapers you want CWallpaper to display in its window. These are set in the file ~/.config/cwallpaper/wallpapers by entering the full path to the image (including the image name!). This is rather a lot of work if you have a lot of wallpapers, but luckily CWallpaper comes with a handy script to accomplish this task nearly effortlessly. In /usr/share/cwallpaper you will find a script makelist.sh. Copy this anywhere in your home directory (I keep it in the ~/.config/cwallpaper/ directory). 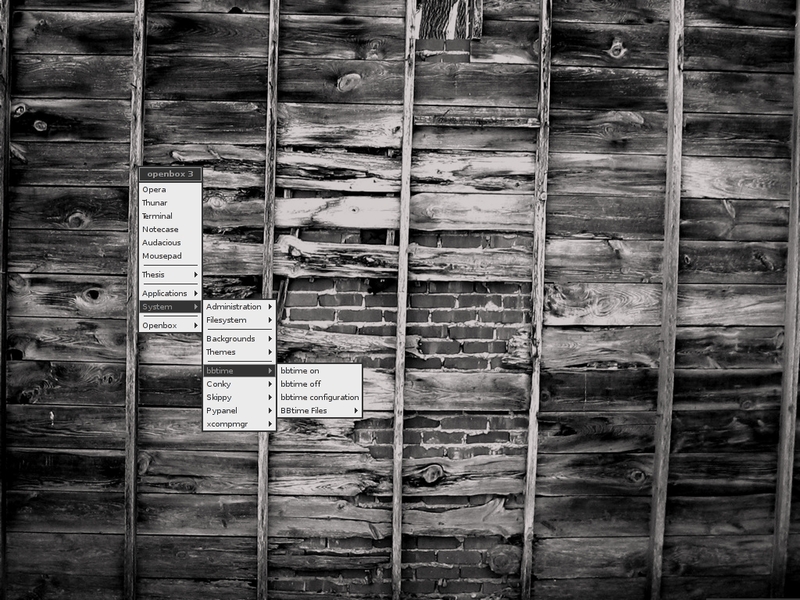 Open the file with your favourite text editor and change all the “$1” with the path to your desktop wallpapers directory. Make the script executable (chmod a+x /path/to/script) and run it. It will automatically generate a wallpapers file in the ~/.config/cwallpaper/. (Note that the script also scans for image files in the subdirectories of the directory specified.) Now run cwallpaper and you will be able to set the wallpaper of your choice. What about an animated wallpaper? If you have xscreensaver installed, you can force it to run on the root window (i.e. the desktop). For guidelines how to do this, have a look at K.Mandla’s post (also here). Telak is especially useful if you want your desktop to display changing graphs, or even webcam images. If you like things psychedelic, xstarfish is your application! It is “an X wallpaper generator. XStarfish generates colourful, tiled images for your background using random numbers fed through mathematical functions. It does not use source image files, so it can generate its images nearly forever without running out of material.” Fun (and headaches) guaranteed! Just run “xstarfish” and it will generate and display a lovely wallpaper. If want it to generate a new wallpaper every x minutes, seconds, or days, use the following command: “xstarfish -d INTERVAL“, where interval is the time you want xstarfish to sleep before creating a new wallpaper (seconds are the default). Be aware that it can take a while to generate a new image. I am clumsy and at times inattentive. Especially after a hard day’s work, I sometimes perform actions on my computer without giving them much thought. I close an application, whereas I only wanted to close the current page; I accidentally save older versions of files and overwrite my latest version in the process; or I reboot my computer when I wanted to log out or shut down. Sometimes my mouse slips and accidentally clicks “shut down” in the Openbox menu, allowing me to see all my unsaved OpenOffice documents disappear before me. I’m sure I’m not the only one who has such moments (or at least I hope so ;-)). If possible I therefore want the computer to ask for a confirmation before I do something drastic. However much I love Openbox, I always missed a dialog box asking me to confirm whether I wanted to log out or shut down. Here is how you can create one. Now you’ll want to add the script to your menu or create a keyboard binding for it in the rc.xml file. This is done like you would for any application, except that the command here is the path to the script, in my case /home/urukrama/.scripts/shutdown. This method work best if you allow users to shut down and reboot without administrative privileges, but will work also if you don’t — just replace all the “sudo”-s with “gksudo” in the script and it will ask you for your password before it shuts down. That’s it. The chances that you accidentally shut down or log out are now a bit smaller.